The starting point for setting up source control integration is to create the repository in FogBugz. To do so, log into FogBugz as an administrator and go to Admin -> Source Control. Click Create New Repository. In the resulting dialog, select Subversion as the type and give the repository a display name. Click Next. The resulting dialog contains scripts and instructions for getting Subversion to transmit changes to FogBugz. Those instructions are provided in more detail below. Select the appropriate tab for the server Subversion runs on and download the scripts. Before you close the dialog, choose whether you want FogBugz to provide links to your check-ins. You can change this setting later by clicking the Edit icon next to the repository on the Admin -> Source Control page. To have FogBugz link to checked-in files directly from cases, you need something that allows you to view file diffs and history logs from a web browser. 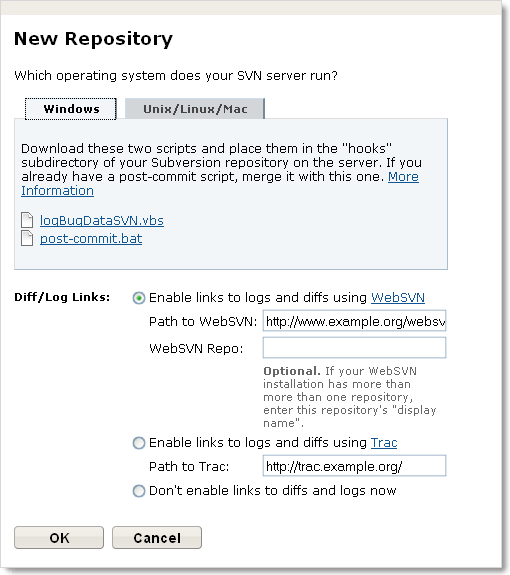 We recommend WebSVN. You can also setup FogBugz to link to logs and diffs in Trac. Once you have WebSVN or Trac installed and working with your Subversion repository, set the path to it in the New Repository dialog and click OK to complete the setup. If your Subversion server is Linux or Unix, make sure that Perl is installed. If your Subversion server is Windows, make sure it has Windows Scripting version 5.6 or later installed. Put the logBugDataSVN and post-commit scripts you downloaded above into Hooks directory in your Subversion repository. If your SVN repository is on Unix, grant executes permissions on both files (chmod +x filename). If you already have a post-commit script, you will need to merge it with this one. Run the following commands from the command line. Notice the important dots. svn propset bugtraq:label "BugzID:" . svn propset bugtraq:url "http://Your FogBugz URL/default.asp?%BUGID%" . 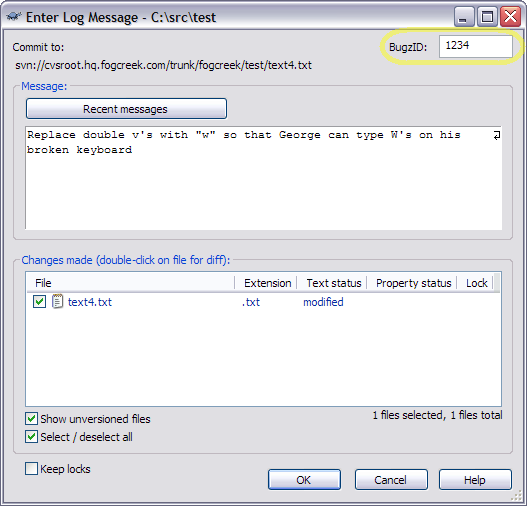 svn propset bugtraq:message "BugzID: %BUGID%" . svn propset bugtraq:number "true" . svn propset bugtraq:warnifnoissue "false" . svn commit -q -m "Added BugzID properties to the repository"
Note that if you would prefer to run these commands from a batch file, you need to escape the % signs by doubling them to prevent the batch file from replacing them with nothing. (e.g. %%BUGID%%). Tortoise will search up your folder path on a checkout looking for this property, so if you check out from other folders in your tree, be sure to do the same procedure for those folders also. We used to ask people to execute the above commands with the -R flag to do this recursively, but it has been reported that this can slow down Subversion. More details are available in this guide about Integrating Issue Trackers with TortoiseSVN. See if the trigger is running. Run post-commit /path/to/svn/root/directory 1234 where the first argument is the root directory of your svn directory, and “1234” is a revision number containing a FogBugz case id. If anything goes wrong, you will see it on your console output. If the above lines DID make an entry on your case, focus on the post-commit script. It’s likely that svnlook is not in the scripts path, and you need to rewrite those lines in the script to use the full path to svnlook. Or the user that subversion runs as may not have permission to run cscript.exe (on windows). If you are using an older version of FogBugz and you see %2F in the URLs where you should see “/”, change your Apache AllowEncodedSlashes configuration. These steps work for most people, but not all. If you’re still having trouble contact us. Friendly people are standing by to help!